It's the winter of 2010 and worry is turning into fear. I'm afraid. We are moving to a new place soon. A place where I have never been and didn't even know it's location on the United States map. We were moving to Iowa. Where? I know, me too. Not Idaho, but Iowa. Home of corn fields, silos, farms for miles, and deer bigger than you have ever seen in your life (mostly slaughtered by vehicles on the sides of the road, blegh!). I had lived in north Alabama for four years. My life was comfortable and familiar. My kids called this place home. And now we were packing up through tears, fears, excitement (just a little) and making the trek north-west 900 miles away. Away from friends, my house I'd made a home (and had written Bible verses on top of all the doorways), my family, my church. All of it. And we were starting new. New is scary and definitely not comfortable. Fast forward nearly five years and I know now it doesn't matter where I live, what I do, the plans I make that succeed or fail. God is always right there moving, planning, dreaming with me. Always. This has been a huge lesson God has taught me over the years. Where I go, He goes. My husband and I recently had another talk about a possible move(this would be the 10th one in our 15 years together). I was telling my sister how much I didn't want to move again, because of the kids. I was half-complaining about how God never stopped any of the moves. I prayed for Him to. But no dice. Later that evening I was thinking about what I had said to my sister about praying for God to intervene and stop the moves and how He didn't. And I realized with a smile, that this world is not my home and this gypsy life, even if it's one I may not want, may be the way God wants to be glorified the most in my life. I had forgotten what I had known all along, God may not have stopped the moves, but He did move with us. He showed up in the form of bringing us new friends, some that are like family now, and new church homes. Personally, He grew my faith. My faith would be very small and shallow if I had never made that first move. If I had instead stomped my foot and refused to go, I would have missed out on a whole lot of experiences, people, and God. My life is richer because of the blessings I gained in the moves. What I gained has more than made up for what I left behind. Today, if you are struggling to make a hard step in faith, I want to encourage you to trust your unknown future to God. Is God asking you take move, take a new job, go after a dream? Where you go, He goes. Always and forever. You can trust Him. **The winners of last week's ornaments giveaway from Come Together Trading are...Mary Bacher-you won the Olive Wood Star Creche and Linda Stoll-you won the Peace Dove ornament!! 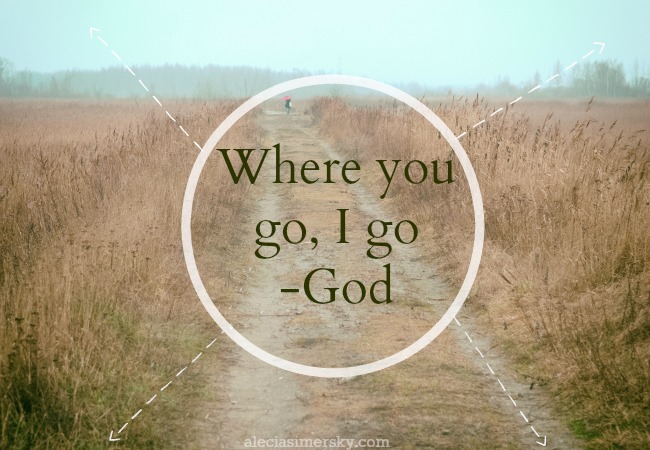 Linking up with: #TellHisStory, Coffee For Your Heart, Thought-Provoking Thurs.